Dateline:1930. The talkie novelty is beginning to taper off. Folks are investing recreational dollars (that is, quarters and dimes) in new fads. There was, after all, some fun to be had outside of movies. The Tom Thumb Menace lamented in the trade press was another word for miniature golf, and was a showman’s bane from Spring 1930 until that September when the craze began subsiding. In the meantime, putting greens were shellacking boxoffices across the country. 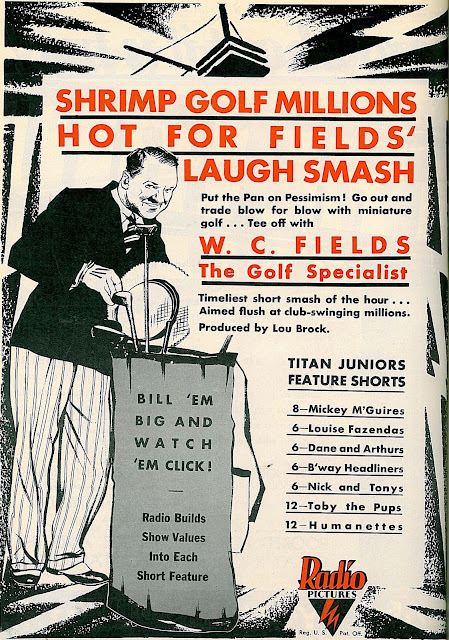 Go Out and Trade Blow For Blow With Miniature Golf advises this ad for W.C. Fields’ short comedy, The Golf Specialist, and note how RKO links its product with the ongoing national craze. Undercutting admissions was the surest weapon interlopers could use against established theatres. If a movie cost fifty cents, why not golf for thirty-five? The Tom Thumbs gained allure from being open most of the night (some past 4 AM). Women could play unescorted, as courses not indoors were often located beneath electric billboards. Being out late in such a safe and sociable environment had appeal movies lacked. It was sport after a fashion, and friendly competition was a handy way of meeting and greeting. Depression dwellers who couldn’t afford the regulation game viewed "Rinky-dink Golf" as a satisfying alternative, and what matter that play was had upon clay or hard sand as opposed to grass? Even movie stars got in on the fad, though industry loyalty encouraged low-key participation. Mary Pickford and Jackie Coogan designed private courses for home play. Mary’s was done in modernistic French style with expressionist palm trees and surreal flower arrangements. Studios supposedly forbade onscreen miniature golfing much as they would televisions years later. One exception was the Our Gang comedy Little Daddy, wherein Roach’s Rascals constructed their own Missing Links Premature Golf Course. A few exhibs figured on joining the craze they knew they couldn’t lick. William C. Smalley of Cooperstown, NY took control by locating golf courses close to his theatres and fixing prices so as not to compete with house admissions. Fifty cents bought a round of putting just as the same amount would gain entrance to Smalley’s movie offering. Cross advertising profited both. 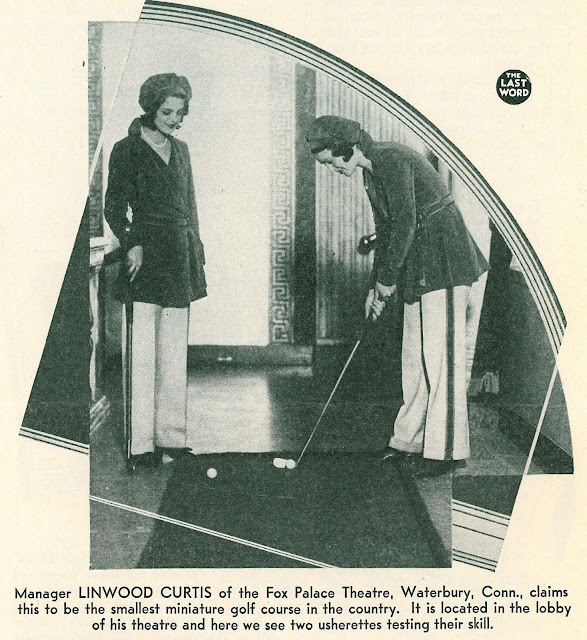 If You Make This Hole In One, You Will Receive Free Admission at Smalley’s Theatre Tonight Where You Will See and Hear Norma Shearer in ‘The Divorcee’. Others figured on luring golfers into makeshift courses put down in mezzanines and lobby corners (as shown here). Tie-ins with civic groups led to cross-pollination between putting tournaments and moviegoing (as shown in this ad). Complementary ducats went to high scorers. 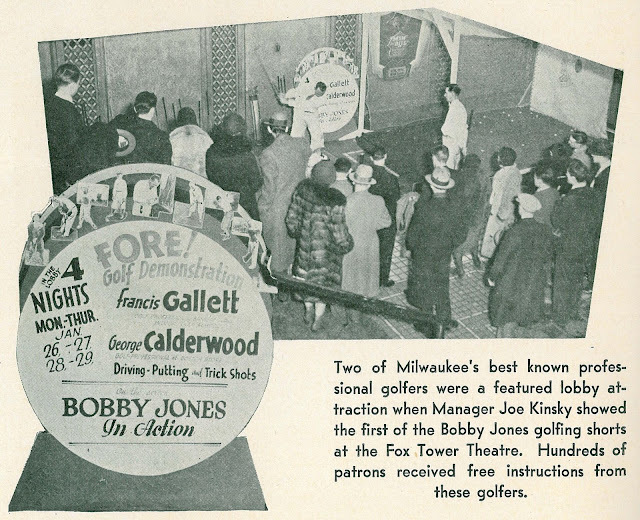 As interest went beyond putting, Warners’ Bobby Jones shorts inspired showmen to conduct demonstrations in the lobby, such as one here in Milwaukee. Miniature golf would peak at 30,000 links nationwide during the thirties, 150 of these at rooftop locations in New York City alone. My hometown’s College Park Cinema was located next to a course owned as well by the theatre’s proprietor. 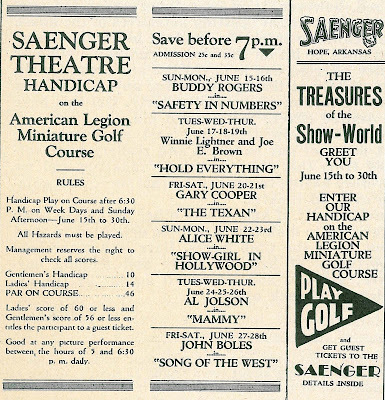 You could play midget golf there in the early seventies, then go next door and see a movie (always Billy Jack, it seemed). Video games have since replaced putting as lobby pastimes, but I wonder what might happen in unlikely event of a modern theatre reviving mini-golf. Just remove one or two of skyscraper-sized standees and you'd reclaim space enough to put in a small course (if not Par 3 fairways!). Have iPods and cell phones numbed kids to the possibilities of enjoying miniature golf? Putt-Putt was one of my favorite activities growing up. Will twenty-first century theatres see its likes again? Very nice post, which I suppose it is based in the previous one dealing with the Bobby Jones shorts. I remember many films dealing with golf, from the silent era to more recent television productions. I always enjoyed to play it (not even to play well) rather than to watch a tournament on television. On what I previously mentioned about the Spanish language series from the Fox Film Corporation (which run from 1930 to 1935) I can suggest you a book titled CITA EN HOLLYWOOD by Juan Heinink and Robert G. Dickson. It was originally based in a study Dickson wrote about the Laurel and Hardy shorts in Spanish and then expanded to all of Hollywood Spanish language productions from 1929 to 1935, although they do mention several others produced in other languages. It is a good book (I had it in Spanish), and a big inspiration for me. The book is rather brief, which lead me to investigate a bit the issue. They used whatever they found in the USA and Spain about it, but did not have access to published material in Latin America. That was sad because there is a lot to uncover. Still, it is a terrific film that tried to display the impact of the sound film revolution in non English speaking countries. I’m not old enough to remember the putt-putt course at the College Park Theater, but I certainly remember during the 1980's that there was a thriving putt-putt course (at least for a few years) next door to West Park Cinemas. Seems like I remember tie-ins between the golf course and the theater too – like make a hole-in-one and get a free ticket or popcorn or something. Do you remember if those businesses were owned by the same person at that time? I remember several Friday evenings as a kid that would include pizza at Village Inn, putt-putt, and a movie all in one outing. In fact, I’m pretty sure that we had that sort of outing when I was officially allowed to see my first rated “R” movie – Trading Places in 1984.